Channel Four Books, 2002. Hardcover. Acceptable. Disclaimer:A readable copy. All pages are intact, and the cover is intact. Pages can include considerable notes-in pen or highlighter-but the notes cannot obscure the text. At ThriftBooks, our motto is: Read More, Spend Less.Dust jacket quality is not guaranteed. Zenith Pr. Used - Good. Ships from Reno, NV. Shows some signs of wear, and may have some markings on the inside. 100% Money Back Guarantee. Shipped to over one million happy customers. Your purchase benefits world literacy! Channel 4 Books, 2002-01. Hardcover. Good. Channel 4 Books, 11/23/2001. Hardcover. Used; Good. **WE SHIP WITHIN 24 HRS FROM LONDON, UK, 98% OF OUR ORDERS ARE RECEIVED WITHIN 7-10 DAYS. We believe you will be completely satisfied with our quick and reliable service. All orders are dispatched as swiftly as possible! Buy with confidence! U.S.A.: Channel 4 Books, 2002. Book. Near Fine. Hardcover. 1st Edition. Hardcover in near fine jacket..
Zenith Pr. Used - Good. Ships from the UK. Former Library book. Shows some signs of wear, and may have some markings on the inside. 100% Money Back Guarantee. Your purchase also supports literacy charities. 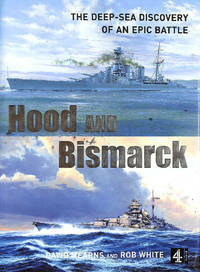 HOOD AND BISMARCK. Deep-Sea Discovery of an Epic Battle. Channel 4. 2001 1st.. 224pp. Prof usely illustrated. Maps. 26x19. Hardback edition. No writing or inscriptions; Fine in -Fine d/j. 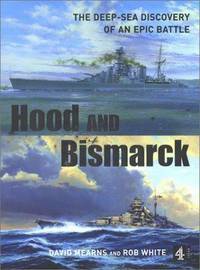 Mearns led an expedition that discovered the wreck of the Hood for the very first time and revisited the wreck of the Bismarck. 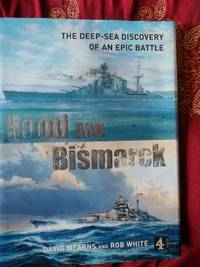 As well as tracing the history of these two vessels and the events that led to their fatal clash, the book chronicles the progress and findings of this incredible mission. 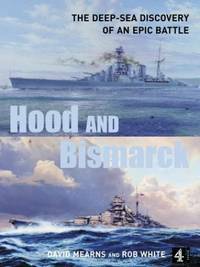 illustrated with over 200 photographs, this book sheds new light on the cataclysmic final battles of the Hood and the Bismarck and is a real gem for anyone interested in naval history. U.S.A.: Channel 4 Books, 2002. Book. Very Good. Hardcover. Slight Spine Lean, Some Light Edgewear To The Jacket, And Other Light Shopwear. Text Is Clean. .
London: Channel 4 Books, 2001. First. hardcover. very good/fine. Illus., mostly in color. 4to, blue cloth, d.w., pages on right side are slightly wavy throughout. (London): Channel 4 Books, (2001). 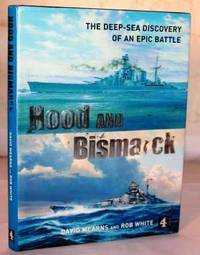 Very good The deep-sea discovery of an epic battle. GB: Channel 4 Books, 2001. Book is in very good plus condition with very minor signs of wear and/or age. Dustwrapper/dustjacket is in very good condition with minor signs of wear and/or age. SPECIAL POSTAL RATES APPLY GB £5. Packed weight. 1100g. 1st Edition. Hardback. nrFine/VG Pc DW. London, United Kingdom: Channel Four Books, 2002 Dj has some edge wear and light rubs.. 1st Edition. Hard Cover. Like New/Good +. 4to - over 9¾" - 12" tall. Zenith Pr. Hardcover. 0752220357 Minimal signs of wear. . Good. 2002.